Based on the Su-33 carrier-based jet fighter, the capable Shenyang J-15 is the centerpiece of China's ambitious naval aviation plans. 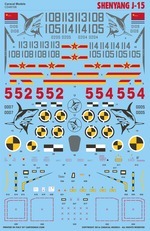 This decal sheet is designed for the Kinetic Su-33 kit, and provides markings for two prototypes as well as four aircraft of the first operational squadron on CNS Liaoning aircraft carrier. 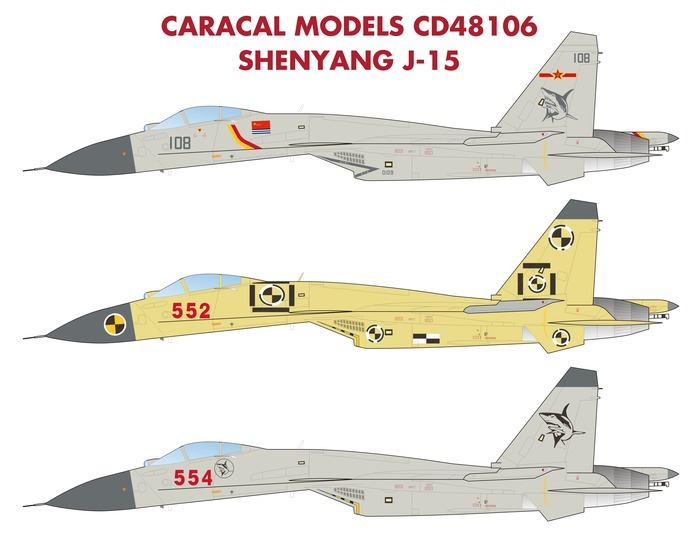 Shenyang J-15 operational examples "108/105/113/114"
Stencilling for one aircraft, and accurate photo-calibration markings as used on both prototype options are included. This sheet was professionally screen printed by Cartograf in Italy. We will start shipping this decal sheet on May 25, 2016. You can preorder this decal sheet securely with your credit card or PayPal account now.